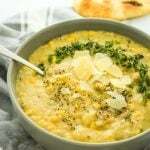 This crockpot poblano corn soup recipe is loaded with smoky, savory flavor and a hint of spice. Add chicken if desired! Lightly spray poblanos with olive oil and arrange them on the baking sheet. Broil for 8-10 minutes, rotating halfway. You’re looking for the skins of the poblanos to turn dark and bubbly. Remove the peppers and place them into a glass bowl to cool for 15-20 minutes. I highly recommend wearing latex gloves for this part of the process! Gently start removing the skins from the pepper – then discard the skins. Remove the tops of the peppers and scoop out the seeds. After you’re done, chop the peppers. Add roasted poblanos, frozen corn potatoes, coconut milk, rice, broth, chipotle powder, salt, pepper, and cayenne. Stir to combine. Cook on high heat for 4 hours. *If desired, you could add chicken to this as well. I would recommend cooking it separately and adding it towards the end of the crockpot’s cook time. *If you don’t want to go to the trouble of roasting the poblanos, this soup would also be delicious with canned green chiles! Use about 1/2 cup.